[ACMPress] – DUBUQUE – Several members of Our Lady of Safe Spaces complained to their pastor after the 10:45 AM Sunday Mass, that a man attempted eye contact during the Kiss of Peace, ACMPress has learned. Go here to read the rest. 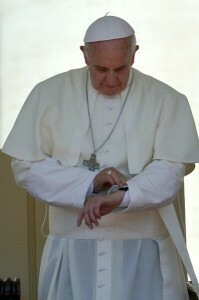 PopeWatch attempted to contact the Vatican for comment, but was advised that “No Comment” is the comment of the Vatican for the foreseeable future on most issues. How can we give the peace of Christ if we do not believe in the Real Presence on the altar after Consecration? The belief, or lack thereof, of the celebrant doesn’t invalidate the consecration as far as I know. It is a sad commentary on our so-called faithful who make up the majority of Catholics who do not believe in the real presence. “For Thine is the kingdom, the power and the glory” was found written by Martin Luther. I was instructed by the good sisters of Saint Felix to never use it and I do not. It grates on my ears like fingernails on a blackboard. All persons are in the Sacred Heart of Jesus on the altar. I come to Mass to meet Jesus, The neighbor I can invite to lunch. The nasty remarks I have suffered at the hands of “nice” people for not shaking their hand is truly debilitating. Now, I just cough and blow my nose and offer my used tissues in my hand for anyone who really cannot live without my handshake. The handshake is really a great way to spread influenza or the new virus with no name. and let us not speak of the talking in Church while other people are trying to pray after Holy Communion…like cattle… even the donkey bowed to the Holy Eucharist but not this stiff necked people. Thanks for sharing my post, Don! Thank you Larry for writing such humorous pieces, which I know from experience are the hardest to write! TLM is (my) favorite form of worship at Holy Mass. Of course we are there for Him and Him to help us. I love my grandmother’s prayer aid. Not the missal but a small booklet of prayers. In the front of the book was the stairway leading up to God the Father then back down to earth. Stairway. Jesus was on the third step leading us to His Father. Then after Holy Communion we are lead back down the steps…to Earth. To neighbor. To family. To the valley of tears. What is God’s favorite Mass? One in which we encounter Him in His Sacred Heart.. fully encapsulated within the heart. A Mt. Tabor moment? What about the one in which we feel the horizontal aspect of the Cross. Not the vertical one? In the Horizontal we accept the snotty Kleenex from our fellow sister sitting, praying and focusing on the vertical aspect of relationship of God. While we accept her Kleenex in our hand we smile and wrap her’s in our own snotty Kleenex, then we throw it away. We remember that God’s presence is not limited to OUR or St. Padre Pio, Thomas Merton or St. Kolbe’s favorite… but unlimited in the scope of the faith. Take the Centurion who’s slave was dying. The Mass is vertical and horizontal. Grandmother’s pictorial explains the importance of mission. A Tabor moment St. Peter wanted perpetually. Reality deals with snot, colds and the illness of valley people. Engaged after TLM works well for me but on some working Sundays I must seek Him in the Ordo. When I do I don’t cringe at the handshake..after all the hand I’m shaking could be HIS. Any time, anywhere, but not, I say NOT, while Jesus Christ, the Real Presence in on the altar after the Consecration of the Mass. ope Benedict XVI tried to have the kiss of peace placed BEFORE the Consecration. Benedict was given short shrift. Benedict did continue with the kiss of peace after the Consecration. I treasure my privacy and do not engage in the handshake. I do not go to confession when I have a cold and I do not receive Our Lord in the mouth when I am sick, lest the priest contaminate his hands. The three Persons of the Blessed Trinity are present in the tabernacle. Where one Person is present all three Persons are present. If the Sacred Heart of Jesus keeps all people, then we too are in the Sacred Heart of Jesus by His choice in the tabernacle. These are my pious practices and I am the least pious of the pious in my parish. Some run circles around me, It is awesome. Everyone has his own and is welcome. The indifferent, not so much. Thank you Philip for the very illuminating essay for my benefit. Be blessed. Prayers. The thanks truly go to you dear Mary. Your tremendous essays on sovereignty, rights, natural law and the freewill adoption of atheism have been mini-workshops for me. Combined with the other gifted and well educated contributors on TAC my feeble perceptions and/or preconceived notions are brought to a clearer light. For that, I thank all of you. a) God is alive and merciful. b) I know very little about many many things. c) My opinions for the most part, should remain my opinions without feeling the prideful need to share them whenever the wind blows. No you may not shirk sharing your opinions for two reasons. First we all need them. Second we need your opinion to discuss and enlighten our minds and hearts. My prayers for you and The American Catholic were said at Mass today. Thank you for spreading the truth as Mary shares the Truth with us. God love and bless you. Do not let an old lady frighten you away, or I shall never forgive myself. The priest says: “The Peace of Christ be with you.” The congregations replies “and with your spirit”. “Let us share some sign of peace” WHY? Wasn’t the Peace of Christ” good enough for the world? Seriously? We are so wonderful we cannot wait to forget Jesus Christ, even while He is with us on the altar, even while we are on the altar with Him. We cannot pray for one without praying for all.